The Sacramento-San Joaquin Delta provides a portion of the water supply for more than 23 million Californians and serves as a vital habitat for over 500 species of wildlife. Water management in the Delta has always been contentious; federal and state agencies must balance the needs of people and the environment, especially in times of water shortage. Following large storms in early March, Senator Dianne Feinstein (D-Calif) and House Majority Leader Kevin McCarthy (R-Calif) called on President Obama to direct federal agencies to maximize water exports to Central Valley farms and southern California cities. On the other hand, the Bureau of Reclamation, a federal authority that operates pumping facilities in the Delta, is considering reducing diversions under the advice of the Fish and Wildlife Service due to the presence of smelt larvae. The smelt population is an important part of the Delta’s food chain and a biological indicator of the ecosystem’s health. Water diversions harm fish populations by drawing fish and their predators to the same area and pulling small fish and their eggs into the pumps. These recent events occurred amid debates over the twin tunnels project in the Delta, officially known as the California WaterFix. The plan would add water intakes and tunnels north of the Delta and away from smelt habitat, but many are concerned over future increases in water exports and impacts on the water supply and ecosystems. The Department of Water Resources increased State Water Project allocation to 45%, a ten percentage point increase since late February. The Bureau of Reclamation has not yet announced its Central Valley Project Water Supply allocation; officials say they need time to produce accurate projections to balance operations for agricultural, municipal, and environmental purposes. Preliminary estimates from the California Employment Development Department show farm employment grew by 7% in 2015, an increase of 30,000 jobs from 2014 levels. Agricultural employment increased in every part of the state. The growth could be a consequence of shifting to more labor-intensive permanent crops, such as almonds and pistachios. Farm input costs also rose in the same period. The Los Angeles Department of Water and Power (LADWP) proposed to set up a better mechanism to discourage wasteful uses of water during the drought. Currently, violations such as hosing down driveways and outdoor watering on off days can cost customers from $100 to $300. Under the new plan, fines would increase as drought conditions worsen. In the worst drought conditions, fines would range from $400 to $1,200 per violation. The motion is being considered by the City Council for approval. Congressmen Jared Huffman (D-San Rafael) and Dana Rohrabacher (R-Huntington Beach) introduced the Water Conservation Tax Parity Act to clarity that turf rebates, like energy rebates, are not taxable. Although the bill will not become law before the tax filing deadline of April 15, it would be retroactive to allow for a future refund. Currently, the State of California provides tax exemption for turf rebates, but the Internal Revenue Service and the Department of Treasury consider them as taxable income. The use of water tanks in Tulare County is becoming a norm for hundreds of families who lack access to running water. Last summer, Tulare County reported about 1,400 private well failures. The county began installing 3,000-gallon tanks and delivering water to residents for free. Initially, only homeowners qualified for the program, but renters were added in December 2015. Currently, there are about 1,500 cumulative reported domestic well failures due to the drought. The City of Santa Barbara will not pursue a subsurface ocean intake for its desalination plant after a study revealed that the process would be infeasible or fail to meet the city’s plan for a large desalination system. The study was criticized for basing its design on a 10,000 acre-feet annual production baseline to account for future expansion, while the proposed desalination plant is currently designed for 3,125 acre-feet per year. Its alternative, an open ocean intake, is typically less expensive but is more harmful to microorganisms and other marine species that are pulled into the intake system. Citing new supply deals and water conservation successes, agencies including the Laguna Beach County Water District and Moulton Niguel Water District recently backed out of a desalination project in Dana Point, Orange County. The South Coast Water District is currently the sole project proponent. President Obama issued a Memorandum and a Federal Action Plan on building national capabilities for long-term drought resilience. The two documents called for data collection and sharing, better communication about drought risk on critical infrastructure, and government support for water conservation and efficiency research. The EPA recently released a “Drought Response and Recovery Guide,” which provides worksheets, best practices, videos, and key resources for water agencies to respond to drought emergencies and build long-term resilience. The guide offers lessons learned from seven small- to medium-sized utilities nationwide, including a case study from Tuolumne Utilities District in Sonora, California. 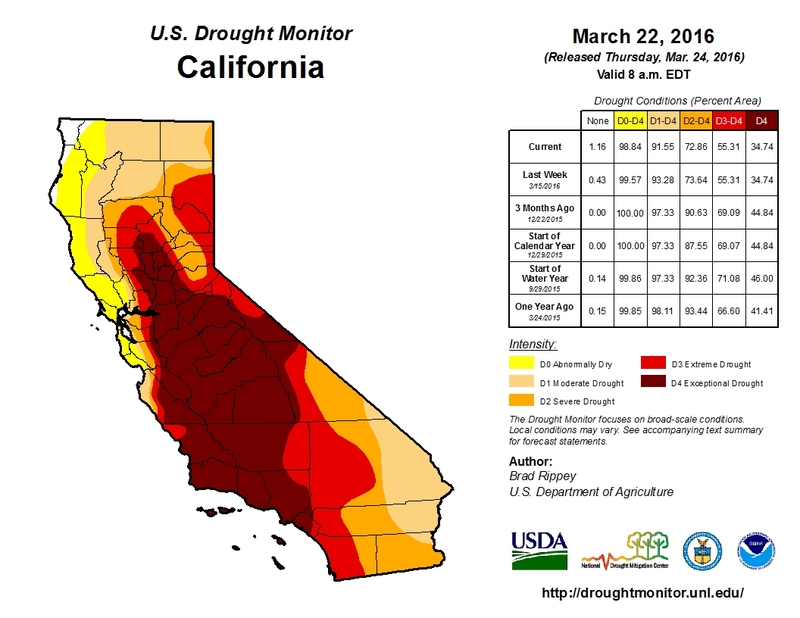 Drought conditions have slightly improved over the last two weeks. Areas under exceptional and extreme drought conditions have shrunk to about 56% of the state. 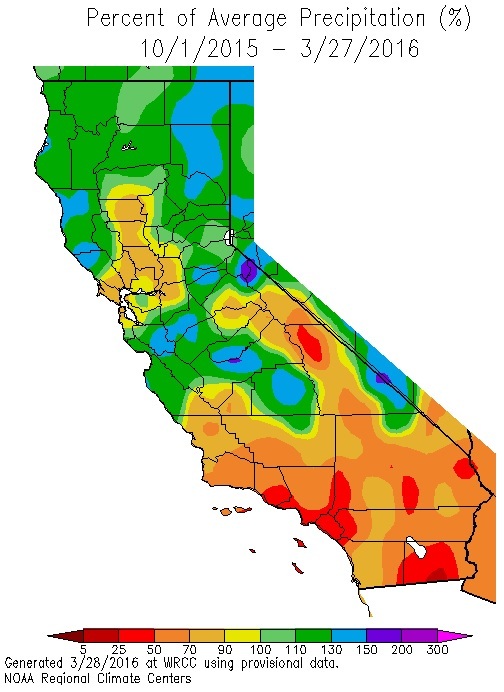 Improvements occurred mostly in the north; long-term severe drought conditions are still entrenched in much of central and southern California. Following heavy precipitation events in early March, dry weather returned to many parts of the state. Snow-water content is at 86% of normal for this date, as of March 28 (see these snowpack plots for changes over time). Cumulative precipitation is about average in the San Joaquin and Tulare basin regions and above average in the Northern Sierra. Water levels in California’s major reservoirs (representing 27.3 million acre-feet of storage) have slightly increased to 59% of statewide capacity, compared to 52% two weeks ago. Levels are considerably higher than last year, but represent about 86% of group average for this date. Lake Oroville, Shasta, and Folsom are now at 113%, 109%, and 109% of historical average, respectively. 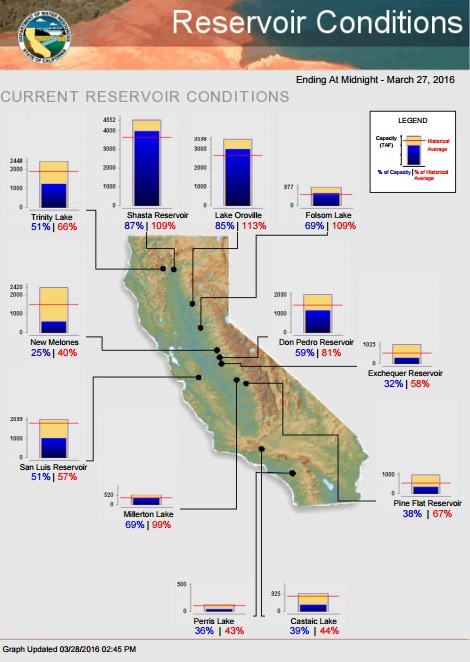 However, many reservoirs in the South Coast and Tulare Lake Basin are still at about 20% to 40% of average capacity. 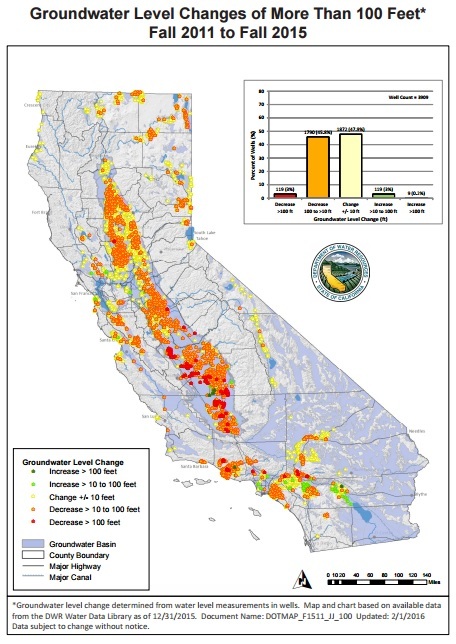 DWR published a map of groundwater level changes from fall 2011 to fall 2015. Areas with the greatest concern, i.e., those areas where groundwater levels have declined by more than 100 feet, can be found in parts of the Tulare Lake, South Coast, and Colorado River hydrologic regions.